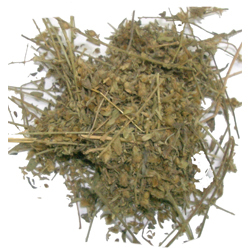 You are at:Home»Herbs»Evolvulus alsinoides Linn. & Wall. Evolvulus alsinoides Linn. & Wall. Latin name : Evolvulus alsinoides Linn. & Wall. Description : The whole plant is used as an acrid, alterative, anthelmintic, astringent, bitter, brain tonic, expectorant, febrifuge, pungent and rejuvenator. It removes nervous debility and improves the nervous system. It increases mental faculties such as memory, intellect and alertness. It is used to cure insomnia, irritability as well as epilepsy, as it has a relaxing effect on the brain. It is a natural tranquilliser, that promotes deep and revitalising sleep. Recommended where the mind becomes overactive, agitated and restless. It is slightly laxative in action and improves digestion. It promotes health of both the male and female reproductive organs. It is a rejuvenative herb with antiaging properties. May also help in preventing changes in the neuron cell bodies in specific brain areas. It is also useful in fever, asthma, bronchitis, biliousness and hypertension. It is a sovereign remedy in bowel complaints especially diarrhoea and dysentery. It has been found to be effective in reducing different types of stress including psychological, chemical and traumatic. Recommended Dosage : 3 to 6 g powder of dried whole plant.